"Speakers are difficult," proclaimed a knowledgeable audiophile a long time ago. But to a kid rapidly developing a love for all things audio, the only difficulty I had with speakers was that I couldnt afford a pair that was worth a sonic damn. My flea-market specials -- vinyl-covered 12-inchers, complete with volume pots for the midrange drivers and paper tweeters -- produced a sound that, even to my uncultivated ear, bore little resemblance to real music. But I readily devoured all the audio magazines had to say (this was pre-Internet), and I believed that there were better speakers out there. In my minds ear, I could hear those multi-driver behemoths in all their glory. All I needed was the dough to pick up a pair and cruise into sonic nirvana. Yes, you can get good sound out of a $1000 pair of boxes, and yes, the RBH MC-6CT does deliver the goods at its asking price of $999 USD per pair. But before you surrender your hard-earned green, youve got to know just whats sonically important to you, and which compromises you can live with. No loudspeaker can be all things to all people. Speakers are primarily mechanical devices, with parts that move to excite the air around them. Compare their operational parameters to power amplifiers, for example, which, save for the power supply (i.e., AC, or, in some rare instances, DC), operate under largely controlled circumstances independent of room acoustics, temperature, humidity, and the choice of materials used in construction. But more than any other piece of audio gear, speakers involve design compromises, and interact with and are sonically affected by their surroundings and choices made in their design, including but not limited to materials and bass-loading principles. As such, they come in a wide variety of flavors. A lot of cash can buy a lot of speaker (though Ive heard exceptions to this general rule), and the law of diminishing returns certainly applies. But even a megabuck speaker will necessarily reflect its designers understanding of what constitutes great sound and how to achieve it. If, at some price point -- say, $100,000/pair -- the theoretical ideal of reproduced sound could be achieved, then all $100,000/pair speakers would sound alike. While a comparison of stratospherically priced designs is beyond the scope of this article, suffice it to say that, even at that end of the price scale, the sonic signatures of different speaker designs vary as greatly as they do among $1000/pair speakers. Each RBH MC-6CT came double-boxed, well protected from neer-do-well shippers. Unpacking them revealed a well-constructed pair of black boxes finished on the sides, top, and bottom in real-wood veneer. Fitnfinish were very good for $999/pair -- actually, good period. Noteworthy was that the deeply figured, well-grained veneer was way beyond the quality of wood (when real wood is used at all) usually found at this price. Each speaker weighs 55 pounds, measures 40"H x 7.75"W x 11.5"D, and cuts a handsome profile. An informal knuckle rap test of the side, top, front, and rear panels of each speaker revealed fairly solid construction; box resonances should not come into play to the degree that they do in less-well-constructed designs. Im particularly sensitive to box resonances -- my Magnepan MG1.6/QR planar speakers have no boxes at all, and their bass is commensurately free of the woolly, boomy quality that vibrating MDF can contribute to the sound. But at least partly for the same reason, the boxless Maggies bass can lack a little weight. Not that the Maggies are bass-shy -- they can just be a little, well, lacking in slam. Choices. The RBH is an acoustic-suspension design, which means its cabinet is sealed. Nowhere is there a port, slot, or other means of egress for the air in the box. The acoustic-suspension principle of bass-loading operates as follows: Air trapped in a sealed cabinet creates a cushion behind the woofer that acts to control the pistonic motion of the driver above its resonance frequency, and limit the drivers motion below that frequency. The 2.5-way RBH has a 1" aluminum-dome tweeter and three 6.5" aluminum woofers. The two lower woofers are strictly for bass duty, and are rolled off at 12dB/octave above 200Hz; the third 6.5" cone is actually a mid-woofer that overlaps the range of the two lower woofers while providing sonic information up through the midrange; the tweeter takes over at 3kHz. While RBH could have designated the mid-woofer for midrange duty only, they chose to use a third woofer to achieve a more powerful response down low. The changes from the first generation of the MC-6CT include a "faceplate" around the tweeter, but the most interesting change made for the second generation is that RBH has done away with the swiveling tweeter of yore in favor of a more ordinary, stationary tweeter. 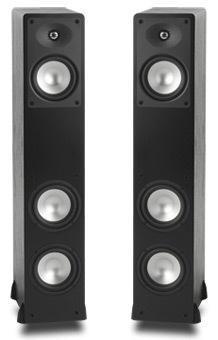 While this move removes some of the placement flexibility inherent in the earlier design, Im acquainted with one owner of that model who tells me that he regularly spends time at each listening session searching for the ideal positions of speaker and tweeter at which the midrange and treble information blend into a seamless sonic portrait. He also tells me that, at a certain point, this exercise ceases to be gratifying. A well-designed crossover can and should address what otherwise might be accomplished by a swiveling tweeter. I like the new version's fixed tweeter just fine. I set up the RBHs in my reference system, which comprises a Sony SACD ES-222 SACD/CD player, a B&K PT-3 preamplifier-tuner, and a B&K ST-2140 power amp. Speaker cables were original 12-gauge Monsters biwiring each speaker. Interconnects were Kimber PBJs all around. I broke the RBHs in with 50 hours of FM interstation noise played at a moderately loud level. The final speaker positions were 30" from the front wall to the back of each cabinet and 80" between the speakers inside walls. I sat 8 away from the fronts of the speakers, my ears at tweeter level, the speakers toed in about 7 degrees toward me. Because the MC-6CT is an acoustic-suspension design, I thought Id begin with some material that would let me hear and understand its bass response. The Christian McBride Bands Vertical Vision [CD, Warner Bros. 48278-2] shows the bassist at his best. The playing is loose yet controlled, and wonderfully expressive. The RBH was highly adept at revealing bass textures, with the right blend of leading-edge attack and harmonic decay to make bass notes crisp and satisfying. On "Technicolor Nightmare," for example, McBride lays down a heavy, driving groove that the RBH timed very nicely, thank you -- there was no blurring or smearing of the bass notes, as Ive heard from lesser designs. However, McBrides bass on this track, and on this disc in general, has a warm tone (it borders on the too warm, in my opinion) that the RBH did not completely capture. The speakers rendition was ever-so-slightly to the leaner side of things. This kind of slight subtraction didnt bother me, and is definitely preferable to the more common thickening and blurring of notes heard from lesser designs. I then thought Id try some old-school metal to hear how well the RBH could head-bang. Mercyful Fate makes Led Zeppelin look like Catholic high school girls. I rate "Evil," from their 1983 release Melissa [CD, Roadrunner RR 8770-2], one of the most intensely powerful rock songs ever recorded. The RBH delivered the power and emotion of "Evil" intact. The guitars were clear and present, and crunched with enough power to get my blood going. The drums and bass hung together correctly -- no overhang or other aberrations to disrupt tempo or intensity. And King Diamonds vocals were handled very well. There were no nasal colorations, no problems with clarity, and diction was highly intelligible. Yes, I could have asked for a little more lower-midrange heft -- a little more chest, a little less throat. The RBHs had no problems when I cranked them to high levels in my medium-sized listening room, nor did they have any problem reaching those levels with a solid 140W behind them. If you listen loud, let em have 100Wpc; for more moderate levels, 50Wpc should suffice. King Diamonds demonic verses gave way to Tony Bennetts considerable vocal gymnastics. On Perfectly Frank [CD, Columbia 52965], Bennett covers two dozen Frank Sinatra classics. Hearing these covers, its not hard to understand why Bennett was Sinatras favorite singer. On "Time After Time," Bennett stretches notes as if a whammy bar is attached to his vocal cords, but it all sounds so natural, so beautiful. The RBHs brought Bennett into my room and allowed me to understand what makes him a great vocalist. All of his inflections were intact, and the singers sense of joy shone through. The separation and placements of instruments were good, although the soundstage depth was only okay. On "Nancy," the slight leanness in the lower midrange that was apparent with the Mercyful Fate album did not manifest itself, but a coolness in the lower treble resulted in a little too much sibilance. Toeing the speakers out by a couple of degrees somewhat alleviated this, at the expense of a slightly flatter soundstage. Warmer-sounding amps and/or preamps and/or cables should go a long way toward taming this mild transgression. Every loudspeaker design involves compromises, but the RBH MC-6CT had many virtues and few vices, and its set of strengths makes it a strong contender at its $999/pair price. It was quick, clean, articulate, and fun to listen to, unfussy about placement, and well finished. It didnt take megawatts to get going, and remained articulate at lower listening levels. Its sins were more of omission than commission, and should be largely ameliorated with the right choice of partnering equipment. It did some things better than my Magnepan MG1.6/QRs, and some things about as well, punching harder than my Maggies in the bass but lacking the panels bass bloom. The RBH was satisfying to listen to with a wide variety of music, and should be revealing enough to respond positively to system upgrades. Speakers may be difficult, but the RBH MC-6CT is easy to recommend.